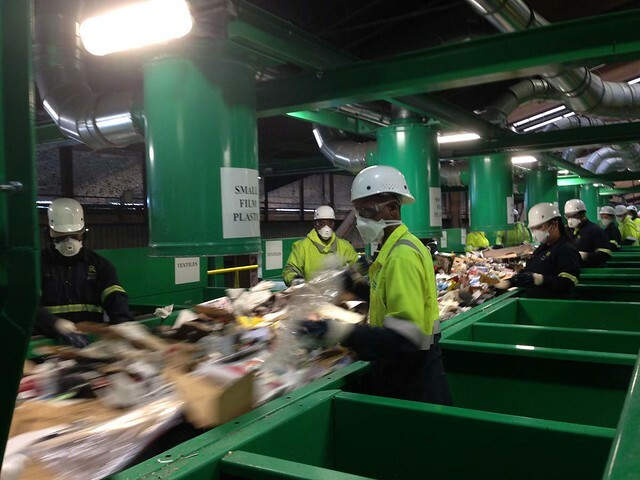 A couple of months ago I went on a tour of Recycle Central, San Francisco’s 200,000-square-foot recycling plant on Pier 96 run by our intrepid garbage resource recovery company Recology. Ever since I wrote Where No City Has Gone Before: San Francisco Will Be World’s First Zero-Waste Town by 2020 for Alternet, I’ve had the opportunity to delve more deeply into the composting component of my city’s efforts to make the very idea of garbage obsolete, but up until this year I hadn’t set foot in the place where the contents of our blue bins go to get reborn. 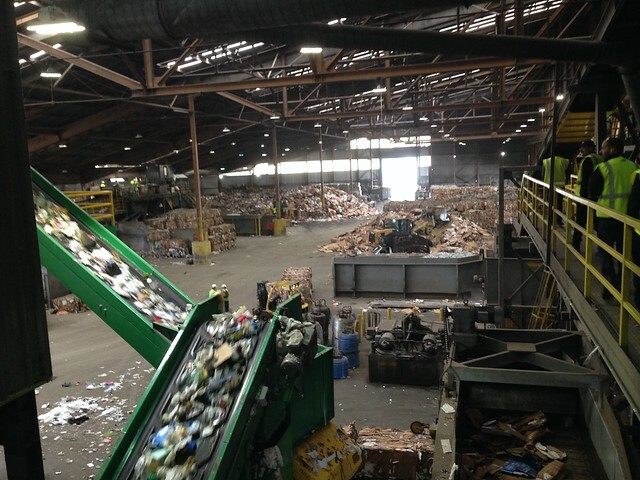 My friend and Recology’s Zero Waste Guru Robert Reed had invited me to join him as he was giving a tour of the facility to a delegation of French officials looking to get a better understanding of what has made San Francisco’s recycling operations so successful (delegations from 82 countries have toured Recycle Central in the last four years!). As someone who has been endlessly fascinated with what comes out the other end of our modern industrial habitations, I wasn’t going to let this unique opportunity slip by. To say this tour was an eye-opening experience would be an understatement. Even for someone as deeply attuned to the human excesses of the material world as myself, there is something awesome — in the original sense of that word — about standing right at the foot of that mighty Mount Consumption. …evokes Edward Burtynski’s Manufactured Landscapes. 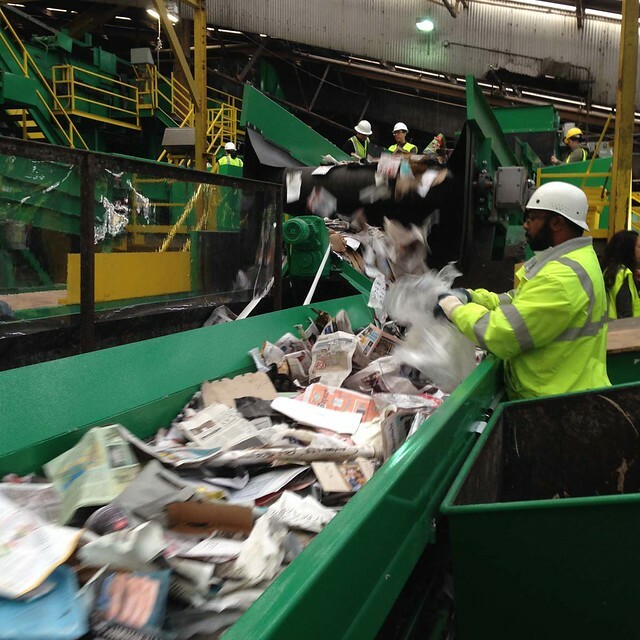 … is the indefatigable poise and grace with which the women and men of the Recology work force make sure to extract those foreign objects that no machine can disentangle. The reason Recycle Central workers seem genuinely happy and were making us laugh in the midst of a rather noisy environment is not only due to the fact that as employee owners they earn a living wage with great benefits and upward mobility within the company, but that they believe in the importance of their mission to move San Francisco toward Zero Waste. 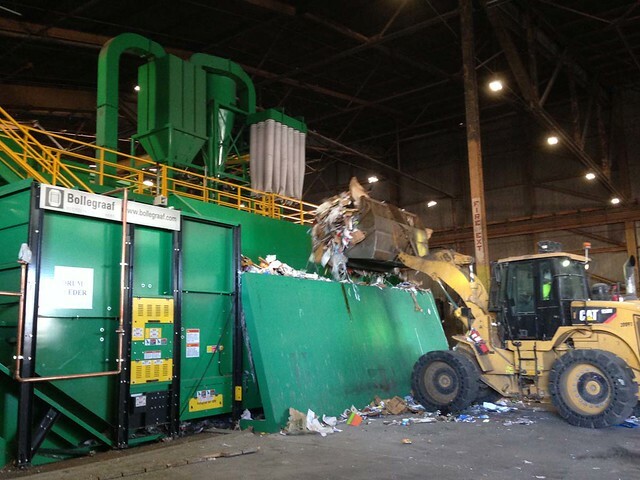 The fact that the city’s wildly successful composting program has made bad odors a thing of the past at the recycling plant is an added bonus. 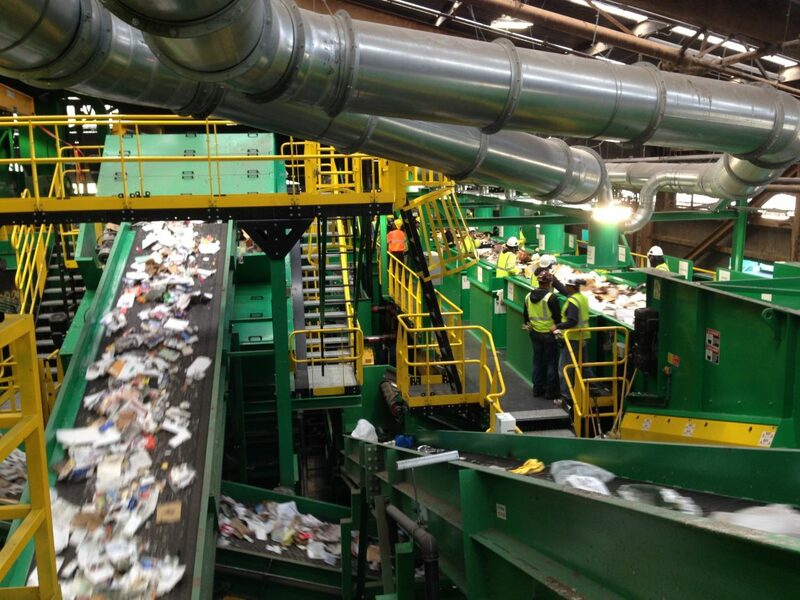 And yet, their lives were just made easier, as a new, state-of-the-art recycling system is now online. When I got an email from Robert the other day to invite me to be among the first to tour and photograph this new system in action, I was hesitant at first. After all, I had just been down there and I’ve got a lot of work on my plate this week. Plus, the post-election blues had put a bit of lead in my feet and fog in my brain, slowing down my zest for extracurricular activities just momentarily. But when Maria Oldiges, a TA I met last week after giving a presentation on ecocities in former poet laureate Robert Hass’ Intro to Environmental Studies class at UC Berkeley, said she’d be psyched to move our follow up meeting on — of all things, waste management — to this location, it was hard to say no. The fact that we both planned on riding our bikes out to Pier 96 on the city’s bayside Indian Basin industrial park was only icing on the cake. Shortly after we got to the tent Recology had set up for the occasion, Robert greeted the various media members (SF Examiner, KTVU) and gave us a quick overview of what to expect. An advanced metering system for inbound materials. 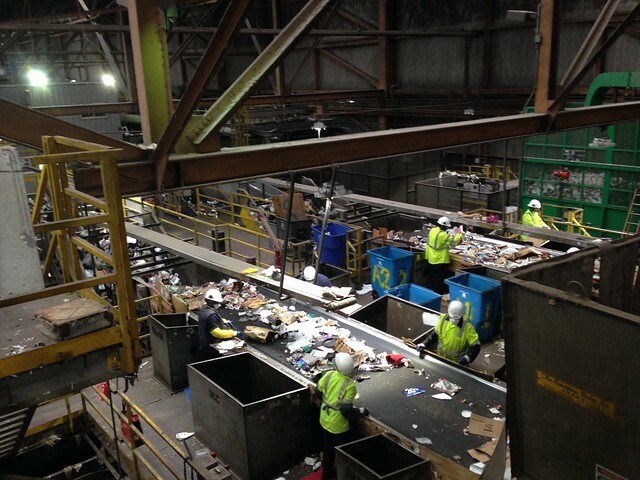 A presort line with 14 sorting stations, the longest in the U.S.
Modern equipment that mechanically separates cardboard and glass bottles from other materials. Two new lines of spinning disk screens that separate paper from plastic containers. 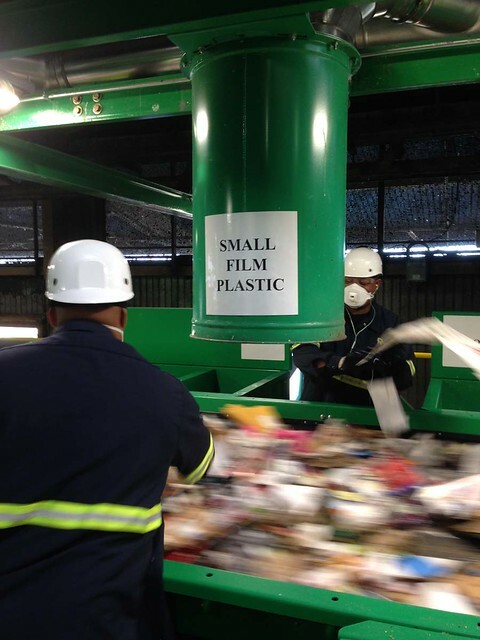 New high-tech optical sorters that separate different types of plastic. A state-of-the-art glass cleaning system. 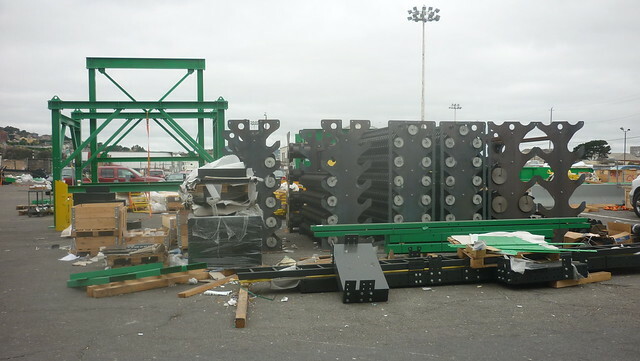 By the way, here’s what this new system looked like as it was being assembled outside the plant during my last visit. As Robert is quick to point out, the purpose of that new capacity is NOT to encourage San Franciscans to consume more stuff but to go deeper and deeper into reclaiming resources that weren’t reclaimable up until now, getting us ever more close to the holy grail of Zero Waste, including the flexibility to recover new materials in the future. Not so fun fact: those materials will almost certainly never include cassette tapes or wire hangers, as they cause horrible jams in the sorters. So please don’t ever put those in your recycling bins. 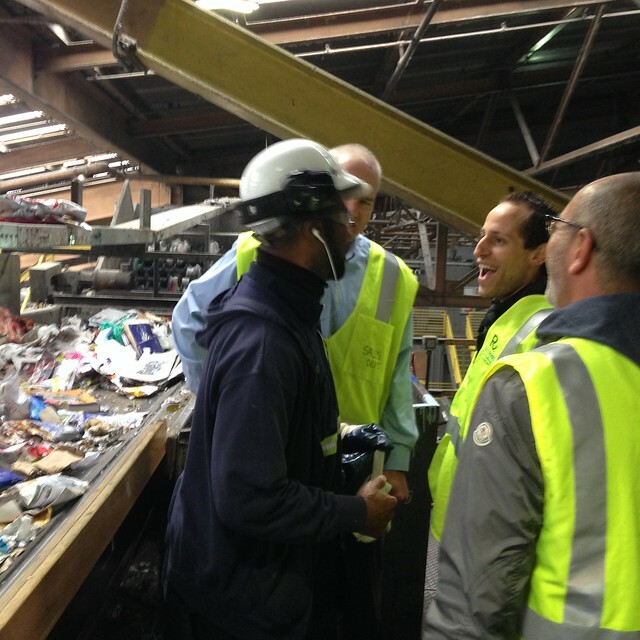 Another important purpose of this modernized line is to allow San Francisco to adapt to the rapidly changing recyclable materials landscape. 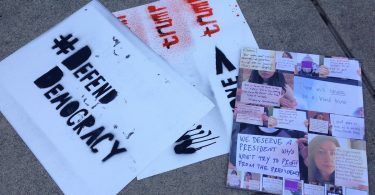 For example, as the amount of newspaper consumed and discarded has declined over the last decade due to our collective shift toward digital media, that same societal paradigm change has brought about an exponential increase in small- and medium-sized cardboard boxes from online shopping and lighter plastic containers for beverages and some foods. 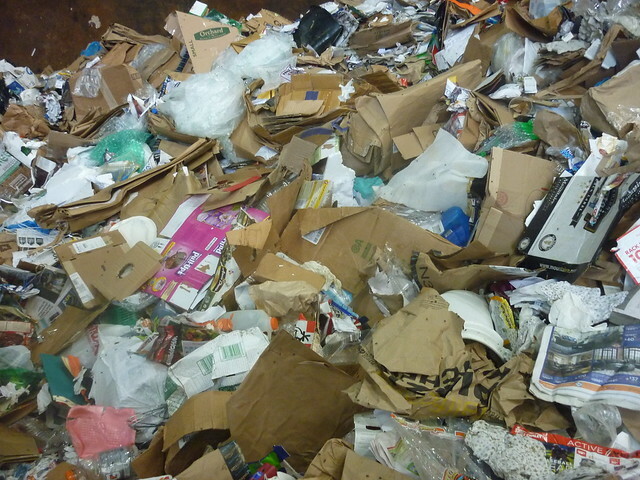 The dominance of cardboard and plastics is palpable when you zoom in on the pile. Thanks Amazon! Our first stop was the new drum feeder, a large piece of equipment that maintains consistent material flow rates to the presort conveyor and material separation screens to improve overall sorting efficiency. It’s certainly an impressive machinery that you don’t want to get too close to. We walked up the stairs past the glass cleaning system that removes smaller and finer glass, which is really bad for the downstream sorting process, before arriving at a landing right next to the new extended sort conveyor. 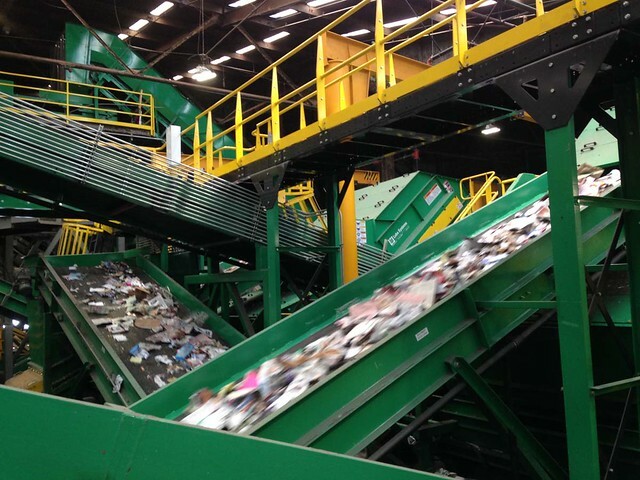 This new system allows for 7 classifiers (workers) on each side, which not only allows for improved separation of materials before they are sent through the mechanical sort screens, but also allows Recycle Central to accept a wider variety of commodities in the comingled recycling streams. 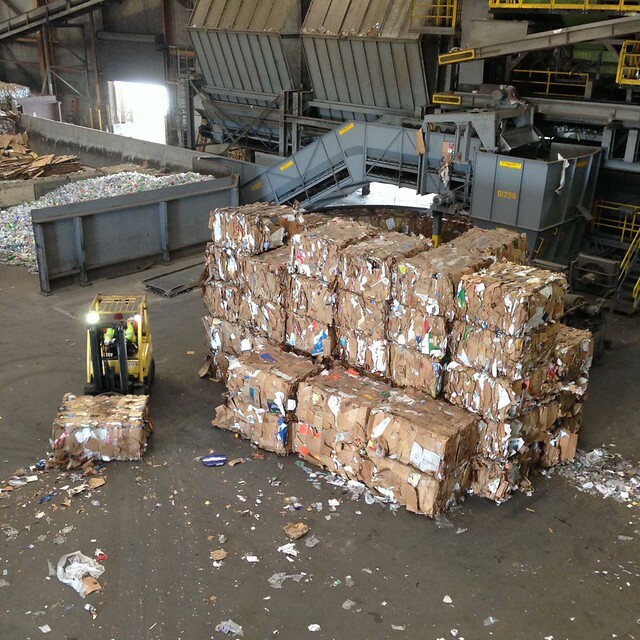 The chutes on either side of each sorting position indicate the respective materials each classifier is focusing on removing. One thing that figuratively and literally blew me away were the new film plastic vacuums which from now on will allow San Franciscans to put soft plastics in their recycling bins. Now let me point out that our first choice as consumers should still always be to avoid soft plastics altogether (and even the hard plastics don’t make much sense once you’ve discovered mason jars and bulk shopping), but seeing these wrappers sucked up into the overhead pipes to be compacted into plastic casing is pretty neat. Speaking of plastics, the new state-of-the-art optical sorters that Recology installed to separate all the different kinds of hard plastics and different grades of paper is a sight and soundscape to behold. In total, the system has four optical sorters capable of ejecting seven different commodities. I shot this video to give you a feel for it. 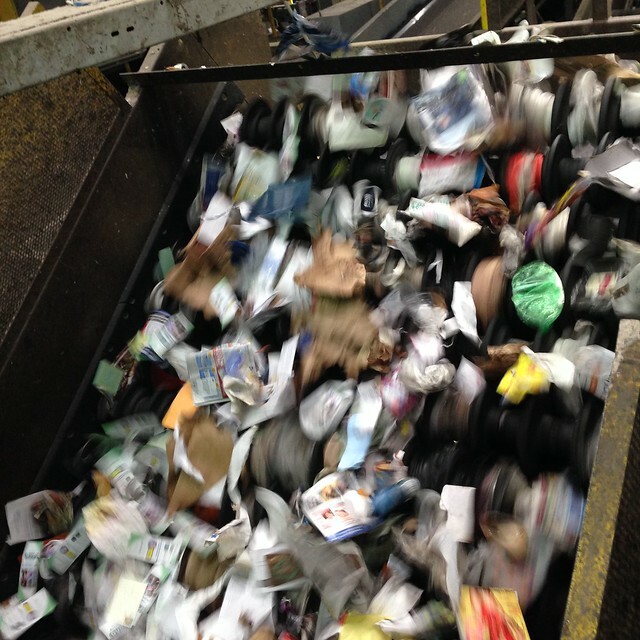 We walked up another flight of stairs past the news and mixed paper lines where similarly weighted foreign plastic materials have to be manually extracted. Maria had a moment of contemplation. It’s really hard not to at this “Temple of Mitigation” for our consumer society. 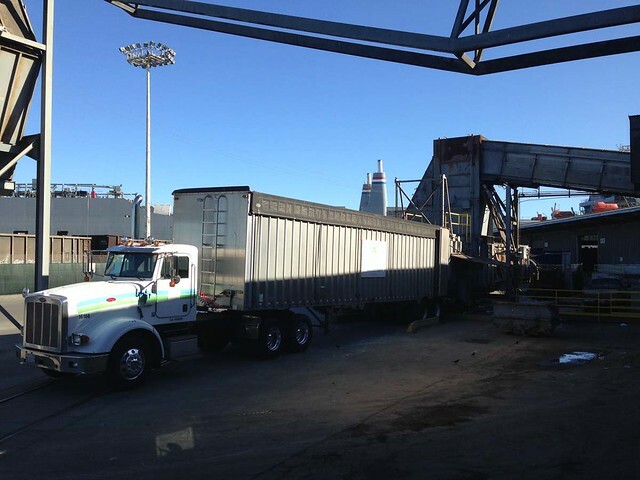 …while only two trucks depart with destination landfill. You do the math. 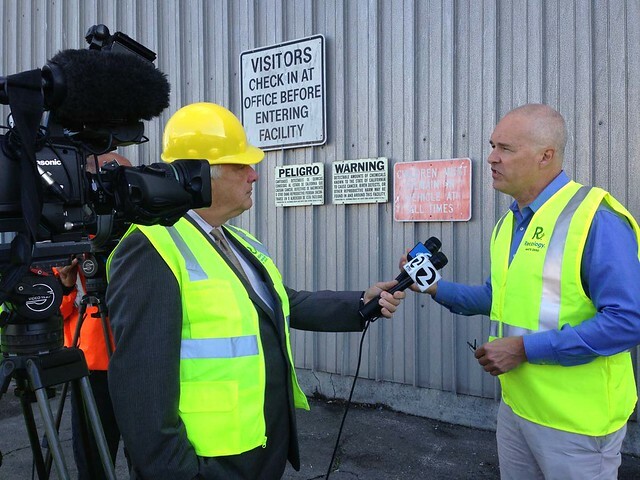 Back outside, we got to chat with the technicians of the system (Van Dyk Recycling Solutions) while Robert shared with the KTVU crew the many ways in which San Franciscans as well as Mother Earth are going to benefit from this, how each of us can do our part to reduce waste by making sure we place all of our recyclables in the blue bin every day while continuing to educate ourselves about our consumption and material flows, and how this could easily be replicated in all cities across the country if we put our hearts and minds to it. Preach! For Maria and I, this signaled the end of a fun and inspiring outing before getting on our bikes again. 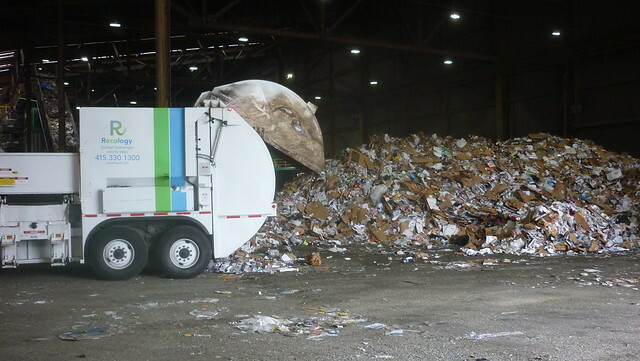 For the good folks at Recology, the cycle just keeps on truckin’. 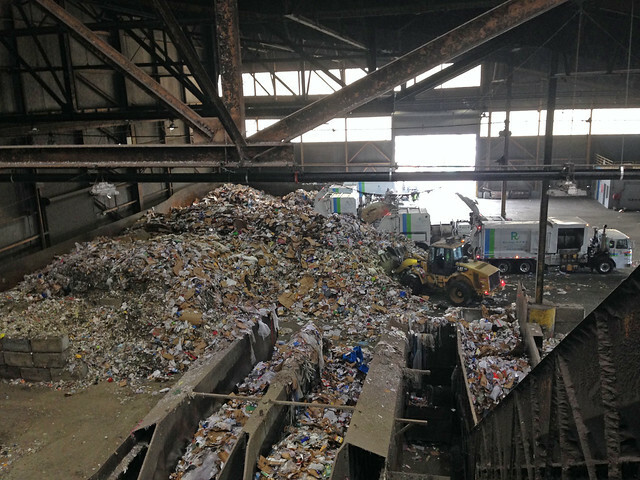 One wish has haunted me since the dawn of US recycling: let us see it happen. 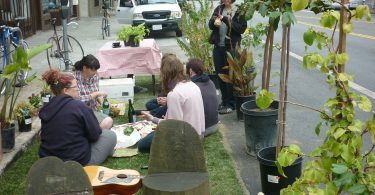 I believe every community member should be invited to glimpse the back-stage events of recycling for a number of reasons, awe being one. Put to rest the false notion that “it’s just a scam, and it all goes into the landfill,” by letting us stand next to the giant bail of material. Yet, never do we get the opportunity. Thank you for taking us with you on this tour. It’s something we should all do (despite a lack of time). 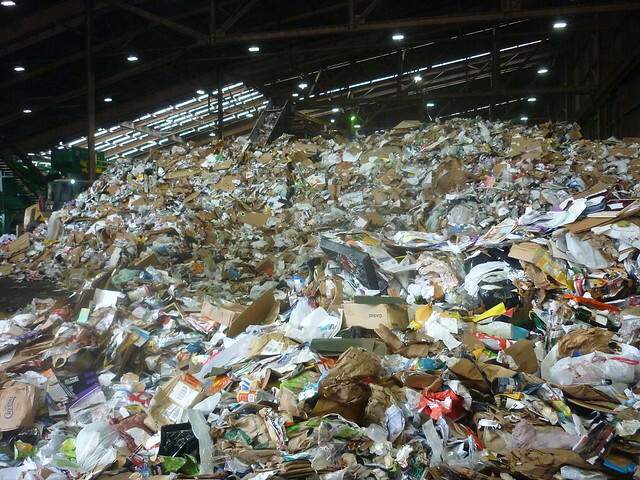 Furthermore, let us take a stop at a Pennsylvania (my state) landfill to really drive home the volume and need. Seeing is indeed believing, as the saying goes. 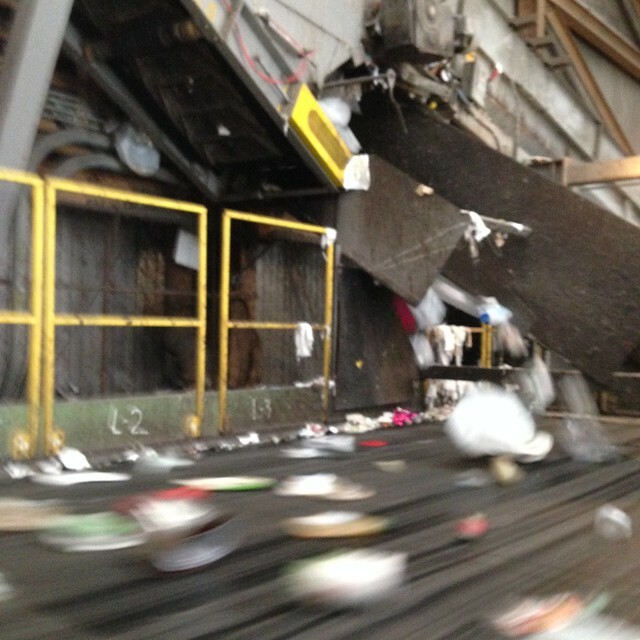 While it’s impossible to verify exactly where every single piece of material that gets handled in the plant ultimately ends up, the fact that this type of facility is able to produce the best sorted, least contaminated, and highest quality materials in the world bodes well for its next place in the material cycle. It’s like with most other things in life: if you commit to doing it 100% instead of just paying lip service, it will succeed and everyone participating in it will succeed along with it. 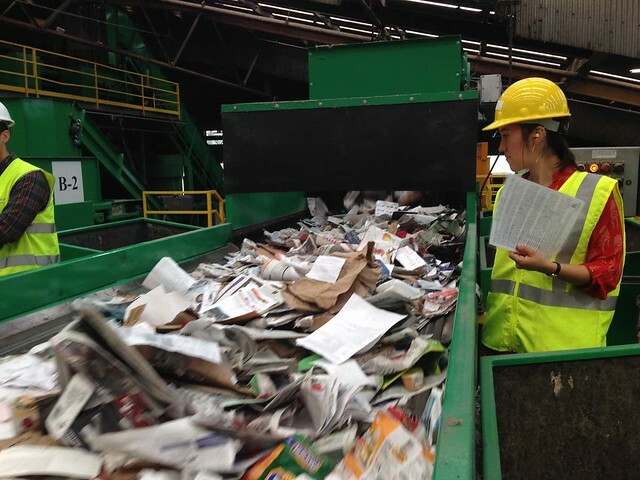 Recology’s and the City of San Francisco’s approach to materials is a great example of the win-win-win inherent in a triple bottom line approach: what’s good for the environment is ultimately good for people as well as the economy. Thanks for stopping by, Ruth! Very informative and exciting. 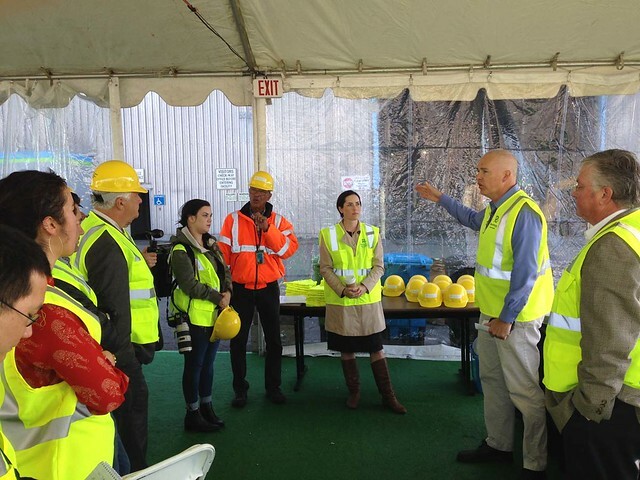 It’s always been on my bucket list to do a tour like this not only at one of our recycling centers but one of our sewage treatment plants as well. 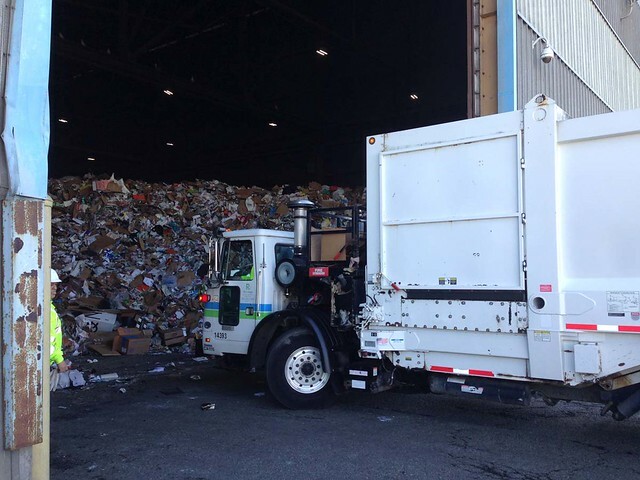 Is Recology a private company or city utility? Does it have positive cash flow? They are a private company but part of a City-regulated utility model, so they may as well be a city agency.